Depending on our availability we can come to your event, watch the event via streaming or watch a video of the event and provide our unique view. We’ll upload photos of the work on Twitter, with the appropriate hashtag, ready for you to retweet. We’ll also provide you with hi-resolution scans and can send you the originals, —nicely framed— so you can put them up in your office or send them to your speakers. Live tweets with photos of the artwork, #hashtag, etc. Where all the UX Pros meet. 3 fantastic days with User Experience Professionals from all over the world. 16 workshops to develop your skills, 10 talks to inspire you and 16 slots open for you to share your experiences. All this coupled with lots of parties and meetups in sunny Lisbon. TechMeetups has been setup to create a global network of Tech communities from San Francisco to Sydney. Ignite Portugal is a series of events open to participation from anyone that revolve around themes like innovation, creativity, entrepreneurship or technology. Each presenter only has 5 minutes to talk, with 20 slides that advance automatically every 15 seconds. This edition was in the Worker's Day. Ignite Portugal is a series of events open to participation from anyone that revolve around themes like innovation, creativity, entrepreneurship or technology. Each presenter only has 5 minutes to talk, with 20 slides that advance automatically every 15 seconds. LeWeb is one of the biggest internet related conferences in Europe. This years speakers included Marissa Mayer, Eric Schmidt, Kevin Rose, Sean Parker and Karl Lagerfeld. We sketched 48 presentations, so be sure to check on Flickr! BET - Bringing Entrepreneurs Together is an event organized by the Business School at Católica University in Lisbon with the goal of bringing Entrepreneurs together. Speakers included Mario Valente and Albano Homem de Melo. Your Office Anywhere is a conference organized by Avila Business Centers about current and future developments in Office use. Silicon Valley Comes to Lisbon is a non-profit event with the goal of promoting intercultural and intellectual sharing, as well as to provide a place of networking for people from diverse backgrounds. Speakers included Paul Kedrosky, Philip Rosedale and Portugal's President Prof. Aníbal Cavaco Silva. 3 days. 24 hours a day. 800 attendees. Talks. Workshops. Lots of food and beverages. 48 hour programming / hacking competition. Quiz Show. Presentation Karaoke. Security Competition. Lots of gaming consoles. LEGO. More food. More beverages. More coding. Sleeping areas. More fun. An unforgettable experience. October 31st, Halloween. About 400 zombies roamed the streets of Lisbon. We were there and didn't get bitten. UXLX is Europe biggest User Experience Conference. This year's speakers included Josh Clark, Leah Buley, Christian Crumlish, Kristina Halvorson and Don Norman. WordCamp Lisboa 2011 is the local WordPress community's WordCamp. Speakers included Hugo Baeta, Isaac Keyet and Scott Berkun from Automattic. (The company that runs WordPress) and several local and international WordPress Users. OFFF Barcelona: OFFF is an entity in continuous transformation, alive and evolutionary. More than a decade ago, it was born as a post-digital culture festival; These days, OFFF keeps being a reference event throughout the world. A festival hosted in Barcelona, New York, Lisbon and Paris. SWITCH is a two-day event that gathers people with different background experiences to discuss technology, science, entrepreneurship, creativity and innovation in a network-friendly environment. I can't read a lick of Portuguese but I can appreciate Bauke's sketchnote style. Live Sketching is a tremendous challenge in Ignite Portugal's peculiar format (5 minutes talks with only 20 slides that auto-advance every 15 seconds) but you did a fantastic job in capturing the soul of both speaker and message. I sense that your talent really enjoyed this kind of challenge. Thank you very much. A sharp mind and an artistic hand: the result is amazing! 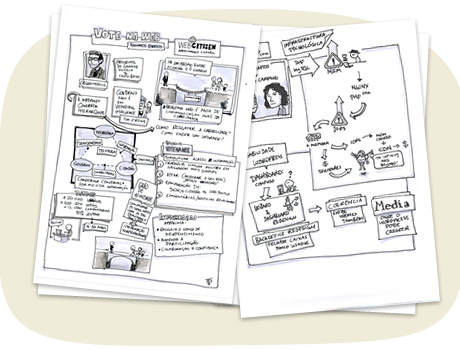 The sketches are a great momento for speakers, organizers and participants alike. I'm always overwhelmed by Bauke's capacity to watch and sketch at the same time, yet fully capturing the essence of the talk. As a conference organizer I always want him in my events. As a speaker, it's delightful to see the final result. As a conference organizer my aim is to provide my audience quality content that can help them in a variety of ways. Through the drawings we were able to preserve the memory of what was said at SWITCH in a very engaging way. The drawings were also a vehicle to promote and pass along the message of the conference. Would recommend and rebook them. Great job! The livesketching.com team was impressive! This was our first collaboration for LeWeb'11 in Paris and it really helped us to enhance the experience of the conference. They worked hard during 3 days to create beautiful AND meaningful illustrations. Both attendees and speakers loved them, as the sketch notes were a perfect way to sum up the keynotes. This kind of artistic retransmission will become for sure a standard for conferences. We loved the illustration you did of "Votenaweb". Congratulations on your talent!